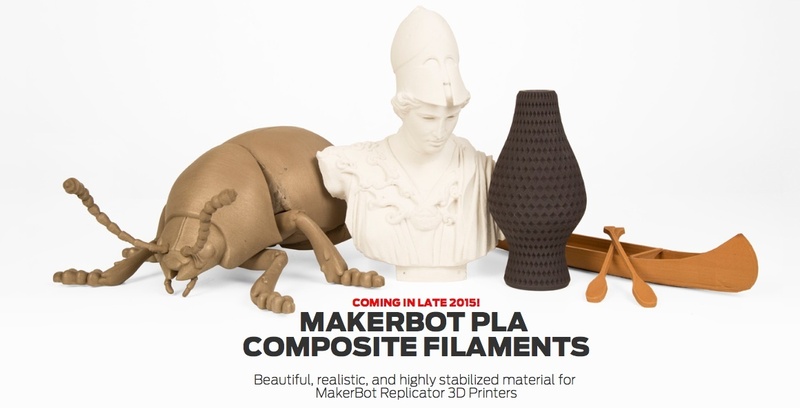 MakerBot has announced that they are going to be releasing multiple new PLA-based composite filaments are made with composites of real Metal, Stone and Wood that should provide beautiful, realistic looking results from your 3D prints. Apparently MakerBot has designed these new materials for 3D printing on their fifth-generation MakerBot Replicator 3D printers that use the new easily swappable Smart Extruder. The company says that it is developing new smart extruders designed especially for the new composite PLA materials, though we expect that the new 3D printer filaments will be compatible with other 3D printers and standard extruders as well. The new filaments are going to be grouped in the three main categories of Metal, Stone and Wood, but there are going to be multiple options for different materials in each of these categories apparently. The MakerBot PLA Composite Filaments that are being shown on CES 2015 include Bronze, Iron, Limestone and Maple. The new 3D printing materials are designed to provide the look and feel of metal, stone and wood materials while they should remain easy to be used as standard PLA filament is. 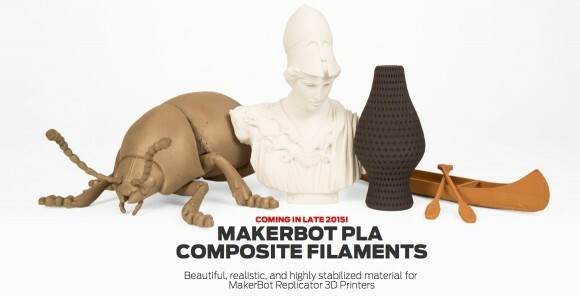 The new MakerBot PLA Composite Filaments are supposed to be available in Late 2015 according to the company’s website and there is still no information about the expected prices. Meanwhile there are already similar materials available from other companies that are designed to be compatible with various 3D printers, especially wood and stone-like with metal ones also soon to be available from various filament manufacturers. So if MakerBot ends up with Late 2015 availability, high prices and compatibility with only their Smart Extruder-based 3D printers things may not be that great for them. Especially if their composite PLA filaments are not significantly better that what is already available or is going to be available soon and if you have to buy a special version of the Smart Extruder for your MakerBot 3D printer to be able to use a specific filament.